Michigan SEO Group: Do You Know How to Succeed on Yelp? We Do! Do You Know How to Succeed on Yelp? We Do! Are you struggling to retain visibility on Yelp? Do you log into Yelp on a regular basis? Are you finding it a challenge to get reviews? Do you communicate effectively with your clients? Knowing the best search engine marketing practices when it comes to Yelp is always a good tactic so you can be one step ahead of your competition. Many people have heard of Yelp, but don’t know what it takes to succeed there. We have the inside scoop, so we’re going to tell you almost everything we know ... and more! Add photos, a detailed business description, up-to-date information, history, and specialties. Put a badge and link to your Yelp listing on your website. Put a "Find us on Yelp" sign in your place of business, on the front counter or window. Include a link to your Yelp business listing in your email signature with the words, "Check us out on Yelp!" Allows you to communicate with your customers. Respond to positive and negative reviews. All these things have been tested and proven, so you know you’re getting the good stuff from experts who use Yelp firsthand. If you start using Yelp on a regular basis and still don’t see a lot of activity on your analytics page, you may need to consult with an SEO expert or online marketing expert. How much time must I commit to my Yelp listing? It depends on how much success you want! If you want to be successful, at least 1-2 hours weekly would be sufficient as a minimum. Can I designate Yelp tasks to someone on my team? Yes, you can designate Yelp tasks to someone on your team who is knowledgeable about your business. They will need to implement a description, history of the company, coupons, pictures, and more. 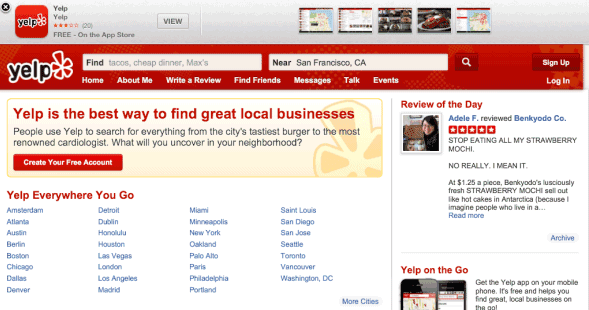 Yes, Yelp is user-friendly. If you need help for any reason and can’t figure out the answer, Yelp has a business support section that answers common questions. At SEO Ann Arbor, “We believe in helping people achieve their dream of a successful, growing business and an abundant life…starting today!” Feel free to give us a call to talk about what you’d like to achieve for your business. We’ll even take a quick look at your website and share our impressions without charging you anything. Even if you don't end up hiring us to do your search engine marketing for you, we like to think we can help educate and inform you. If your website is not on Page One of Google, contact us today!